Turn Key Air Conditioning are one of the UKs leading providers of affordable, energy efficient, state of the art air conditioning. With clients ranging from cafes to hospitals, offices to airports, TKAC design effective air conditioning and climate control systems for any environment. TK Air Conditioning work closely with their clients in the design of air conditioning for new and existing premises. Whether it is new build, with air conditioning included in the initial plans, or retro fitting air conditioning into older buildings, TKAC devise air conditioning solutions that are unique to every client. One of the many strengths of Turn Key Air Conditioning is to work around the business needs of the client. For this reason up to 80% of the installation of new air conditioning is completed off-site. For clients including schools, hospitals and hotels, Turn Key have installed air conditioning units for the whole premises without disrupting a single student, patient or guest. TKAC works with all the leading air conditioning manufacturers including Toshiba, Daiku and Mitsubishi. We are proud to be a Business Solutions Partner with Mitsubishi but in order to guarantee the best air conditioning system for every client we will always match the product to the project. Turn Key Air Conditiong also have a flourishing maintenance arm, servicing and maintaining air conditioning systems for over 1,000 companies across the UK. With maintenance and servicing teams in most majot cities and towns including Newcastle, Doncaster, Birmingham, London, Bolton, Bristol, Cardiff, Plymouth, Fort William, Edinburgh, Glasgow, Limavady (N Ireland), St Helier (Jersey) and Douglas (Isle of Man) you are never far from a TKAC engineer. For more information on Turn Key Air Conditioning, check out the TKAC page on our website or visit them at tkac.co.uk. To make air conditioning even more affordable why not take a look at leaseairconditioning.co.uk, specialist in Lease Hire Finance for air conditioning installation projects. Air conditioning and climate control is something we all but take for granted in our cars and it is something we are growing to expect from shops, hotels, restaurants, airports and other public spaces. Most businesses would love to include air conditioning in their office envronments and retail outlets but are concerned about the cost. Air conditioning is less expensive than many people believe, especially when it is provided by Turn Key Air Conditioning: a company with a great reputation for cost effective and energy efficient design, installation and maintenance services. Turn Key partners, Lease Air Conditioning have come up with an even better deal for businesses, landlords and property agents. Lease Hire Finance for air conditioning installation spreads the costs and takes advantages of the fact that air conditioning can be a 100% tax deductable expense. Lease Air Conditioning is good news for new businesses as it does not demand any initial expenses. Fixed payments are not subject to interest variations and all costs can be factored into the business plan and budgeted accordingly. Lease Air Conditioning is good news for established businesses and landlords as very often the cost of the whole project – not just the installation of new air conditioning – can be written off against tax. Lease Air Conditioning is good news for architects and building designers as contractors fees, as well as air conditioning maintenance costs, can be included in the Lease Finance Agreement. For more information on Lease Air Conditioning, visit the LAC page on our website or check them out at http://www.leaseairconditioning.co.uk/. Unicorn Sheet Metal Works Ltd would like to welcome our friends and web partners, Newgate Air Systems to our website. Newgate Air Systems are a UK company with an international reputational for designing, manufacturing and installing gas & dust extraction systems for industry. Many industrial processes create toxic gases & fumes as unwelcome by-products. Newgate Air Systems develops practical and affordable solutions for the safe extraction and removal of the harmful pollutants and contaminants from the environment. Customers of Newgate Air Systems include petro-chemical & parmaceutical companies, factories, workshops, automotive manufacturers and repair centres. They also work with electronics & I.T. companies in the creation of ‘clean room’ workspaces. Fume extraction and dust collection is a key reponsibility of many manufacturers and the safe removal of harmful pollutants is covered by UK and EU legislation. 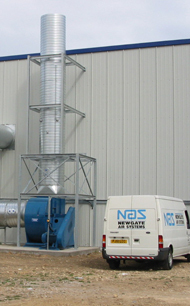 Newgate Air Systems have over 15 years experience of designing fume extraction and dust collection systems that meet all envirnomental standards. They are also a registered member of the Contractors Health & Safety Assessment Scheme (CHAS). The great strength of Newgate Air Systems is in the design and installation of gas extraction systems that are individually tailored to the customer. Bespoke solutions maximise efficiency and minimise waste. They allow Newgate Air to take into account the specific requirements of the customer and have led to Newgate Air developing a specialism in multi-function extraction techniques, particularly important for industries that need to remove several pollutants and contaminants simultaeously.